AGL d6, SMT d12, SPT d12+2, STR d8, VIG d10, PAR 5 (+6 skulls = 11), TGH 7, Cha +4, PP 25. Rank: Legendary, Fate Chips 3, Wounds 3/I (+6 skulls). Edges: Arcane Background (Shaman), Arcane Resistance, Very Attractive, Command Presence, Followers, Master Shaman, Wizard. Skills: Medicine d12 (d10 Wild Die), Fighting d6, Knowledge (History) d10, Language (English) d10, Notice d10, Riding d6, Shooting d4, Talent (Art) d8, Throw d8. Powers: Banish, Boost/Lower Trait, Darksight, Detect/Conceal Arcana, Dispel, Divination, Fear, Greater Healing, Implant Suggestion, Light/Obscure, Puppet, Ritual of the Black Sipapu, Speak Language, Teleport, Walk the Ghost Roads. Special Abilities: Attack: Special Action Powers. It is immaterial if Wínyan Núpa is the source of the legend bearing her name, or whether she’s merely an ancient sorceress who capitalized on an existing myth—not even Wínyan Núpa herself recalls the truth. She has existed in the Americas for a thousand years, using magic and cunning to thrive among the various indigenous nations and tribes. Now more demonic than human, Wínyan Núpa attains this immortality through the Ritual of Rebirth, a process that consumes the life essence of a manitou to fuel her migration into a new “host” body—invariably a beautiful young maiden, and always a willing participant in the ritual. During the first year of “Habitation,” the host’s face slowly transforms into that of Wínyan Núpa’s, while her original face begins to emerge from the back of her own skull. This host face bear all the horrors of aging and moral decay; like a native Dorian Gray, as Wínyan Núpa becomes increasingly more beautiful, her second face transforms into a hideous ogress. Worse, the host’s consciousness remains trapped inside the shared body, gradually taking on more of the demon’s characteristics. This awful process unnaturally extends the life of the host body, and Wínyan Núpa has been known to reside in a single body for nearly a century. However, the longer she prolongs the host’s natural death, the more deformed the host’s trapped consciousness becomes, and Wínyan Núpa soon feels compelled to increasingly more wicked acts—cannibalism, infanticide, and mass murder are not unknown. By this time, Wínyan Núpa has usually found a worshipper willing to make the transformation, and the process begins anew. This is Wínyan Núpa’s most sacred power, and requires a young female host who must be willing to make the sacrifice. A reluctant or unwilling host offers too much resistance, deforming the entrapped consciousness too quickly and resulting in a particularly evil Habitation which must be aborted after a few years of monstrous behavior. The Ritual of Rebirth must be performed during the New Moon, and requires the essence of a manitou. This manitou will be consumed by Wínyan Núpa, and unlike the human host, does not need to be a willing participant. Fortunately for the sorceress, even a newly-created manitou will suffice, and Wínyan Núpa usually conjures a new manitou from a minor Deadlands—a nearby battlefield or the scene of a recent tragedy are always useful, but in rare cases Wínyan Núpa will instigate mass human sacrifice and do the job herself! These newborn manitous are usually housed in a mortal vessel until the Ritual is ready, generally a “spirit animal” but sometimes a human being. To begin the Ritual, Wínyan Núpa sacrifices the manitou and absorbs its spirit. The sorceress matches her Spirit against that of the manitou and makes an Opposed Spirit roll. She may add a +1 bonus for every Spirit die possessed by a willing host. A failure frees the manitou and kills the host, forcing Wínyan Núpa to begin the process anew. A successful roll consumes the essence of the manitou, allowing Wínyan Núpa to migrate her consciousness into the body of the host. Wínyan Núpa assumes control of her new body, and completes the Ritual by consuming the heart of her discarded body. This two-faced corpse is usually buried, burned, or sunk into a nearby lake. Wínyan Núpa’s second face has the ability to paralyze any human being who meets its gaze. Upon making eye contact, the victim must roll his Vigor against the Wínyan Núpa’s Spirit. A critical success or a raise renders the victim immune to Wínyan Núpa’s gaze. A success brings an automatic Shaken. A failure paralyzes the victim, who finds himself unable to move until Wínyan Núpa allows it, or his eyes are physically closed by another. A critical failure brings instant death. Unlike the glance of a traditional gorgon, the gaze of Wínyan Núpa may not be reflected back to harm the sorceress herself. Each round spend devouring the flesh or blood of a mortal, Wínyan Núpa regains one Wound Level and 5 Power Points. Once per lunar cycle, Wínyan Núpa may create a “spawn,” a servant that acts as a lesser supernatural version of herself. In order to transform a living being into her servant, Wínyan Núpa must first find an Indian woman who has caused the death of her own child, whether by deliberate action or through some malfeasance. This may be abortion, infanticide, murder, or neglect. Wínyan Núpa then lures this woman into a pact, usually by offering her some form of redemption; but occasionally she’ll resort to coercion. Once Wínyan Núpa has acquired her “consent,” she marks this unfortunate creature with a medicine symbol drawn into the back of her skull using an ointment made from herbs blended with her own blood. Wínyan Núpa casts the spell by spending a Power Point and driving a bone needle into her own flesh. Upon activation, the marked vessel loses her own identity, and becomes transformed into a “wínyan núpa,” as described in the Deadlands Bestiary. Because each spawn places a permanent hold on one of Wínyan Núpa’s Power Points, the sorceress may only retain as many servants as she has Power Points, and is unlikely to have four or five active at any given time. If one of her spawn is slain, the Power Point returns. Wínyan Núpa rarely travels without a rawhide parfleche containing several human skulls, each painted with strange medicine symbols and decorated with feathers, quartz, and coins. If she is ever attacked, these skulls immediately appear around her head, whizzing and chattering as the whirl about her body. Each skull adds a point of Parry, and each skull can absorb 3 Wound Levels before shattering. This also eliminates its point of Parry. These skulls are not easy to replace, as they must be culled from her discarded bodies! She currently has six skulls, but this number may be adjusted as the Marshal sees fit. Wínyan Núpa is also a powerful medicine woman, and has a host of traditional Shamanistic powers to draw from. These cost Power Points, and are used according to the standard Deadlands rules. In combat, Wínyan Núpa immediately calls forth her Halo of Skulls. She prefers to use her suite of Special Abilities rather than cast spells, but she won’t hesitate to use Lower Trait on her opponents, and she’ll immediately use Banish or Dispel if necessary. She never fights to the death—if things are not going her way, she’ll Teleport to safety, using the rest of her Power Points to increase the distance. Wínyan Núpa does not actually fight with traditional weapons. Instead, she has a suite of Action Powers, each activated by the type of action card she draws in combat. A fifth “joker” power is also available. Upon drawing a club card, Wínyan Núpa tears the bones out of a nearby corpse or extra. The number of bones is equal to the value of the card. These bones fly through the air and batter her victim, doing 1d6 DAM each. If she draws a face card, the bones do 1d8 DAM each. If she draws the ace of clubs, a single rib is torn from one of her attackers, causing 11d6 DAM and permanently reducing the victim by one Agility die. This is actually not an attack, but a defensive action. Upon drawing a diamond card, Wínyan Núpa may add the value of the card to her Parry for the remainder of that action round. If she draws a face card, she may add +10 to Parry and gains an additional Wound level as well. This Wound Level lasts the entire fight. If she draws the ace of diamonds, she adds +10 to Parry for this round, and may call forth an extra skull for her Halo of Skulls. Upon drawing a heart card, Wínyan Núpa unleashes a bolt of agony into her opponent, clutching his heart in icy claws of death. This attack is made against Vigor, and does 1d6+card# points of damage. If she draws a Face card, she may attack twice that round at 1d6+10. If she draws the ace of hearts, her single attack immediately Incapacitates her victim. If he fails his Bleeding Out roll, he is afflicted with the Heartsick injury. Upon drawing a spade, Wínyan Núpa may send out her “Face of Horror.” This is a magical attack against her opponent’s Spirit. He feels the spirit of Wínyan Núpa attempting to “press her face” into his own flesh, and may even see the face traveling across the material world as it enters him. He is Shaken that round, and must roll against a Target Number equal to the face card, not the usual TN-4. If she draws a face card, she may send out two Faces of Horror. If she draws the ace of spades, her victim transforms into a wínyan núpa that round, and is taken over by the Marshal, who must use the player character’s most powerful and devastating ability against his own party. Upon drawing the joker, Wínyan Núpa may remove it from the deck and use it as an extra Fate Chip. She then draws a second card, granting her the first action of the round no matter its face value. Playing her joker Fate Chip returns the joker to the deck, which is reshuffled. Wínyan Núpa has many material possessions. Not only is she a thousand years old, she has the habits of a magpie, keeping numerous keepsakes and trinkets from her many passages through life. Indeed, she travels with several chests and satchels full of clothing, jewelry, and curios, from a Russian samovar set to a modern Voltagrafo machine complete with several recordings of Wagner. However, there are two magical possessions that may be claimed by anyone powerful enough to defeat her—Wínyan Núpa’s Book of Faces, and her set of Cannibal Cutlery. Both are detailed under the “Deadlands Relics” section. Although Wínyan Núpa has frequently suggested herself as the origin of the Aztec legend of Tlazolteotl, another interesting development in her long history was her association with the Cult of Coatlicue. With its origins in Aztec Mexico during the 1300s, the Cult of Coatlicue formed when Wínyan Núpa cultivated a group of willing worshippers. Eventually growing bored, the sorceress moved on, but some of her worshippers secretly followed her and developed into a cult. Confusing her with a living incarnation of the Snake Woman, they began practicing magic in her name, drawing power from low-level manitous created from the pain and suffering left in her wake. Growing bolder, the cult began digging up the cast-off bodies discarded by Wínyan Núpa, flaying the twin faces from their skulls and using them to cast increasingly more powerful spells. Eventually Wínyan Núpa grew fearful of their activities and hunted them to extermination in the early 1600s. Whether she was entirely successful—or whether some of these dead skin masks still remain—is up to the Marshal’s discretion. Wínyan Núpa has her origins in the legends of the Plains Indians, but two-faced monsters and extreme examples of “craniopagus parasiticus” are fairly common throughout folklore: the Futakuchi-onna of Japanese legend, the Edward Mordake hoax, and even Professor Quirrel and Claire Densmore from modern literature. And then there’s Kuato from Total Recall—Yeesh. I’m indebted to the Two-Face entry on the ever-reliable Native-Languages.org site. 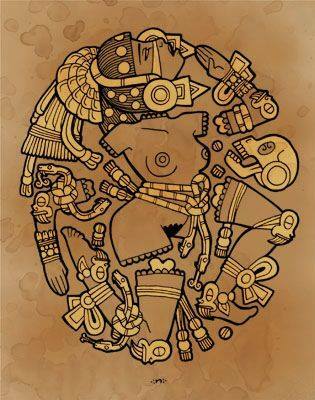 The title banner incorporates an image from an Aztec codex depicting Tlazolteotl, the goddess of filth. 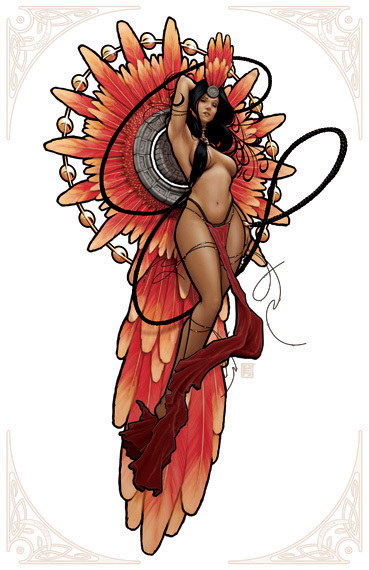 Obvious a more horrifying rendering of the sorceress; perhaps this shows her “second face?” The beautiful illustration that follows is a more pleasing rendering of Tlazolteotl, created by the great John Tyler Christopher for White Wolf’s Scion game. The next image of Coatlicue—the one showing her broken in pieces—remains unattributed; another casualty of Pinterest. 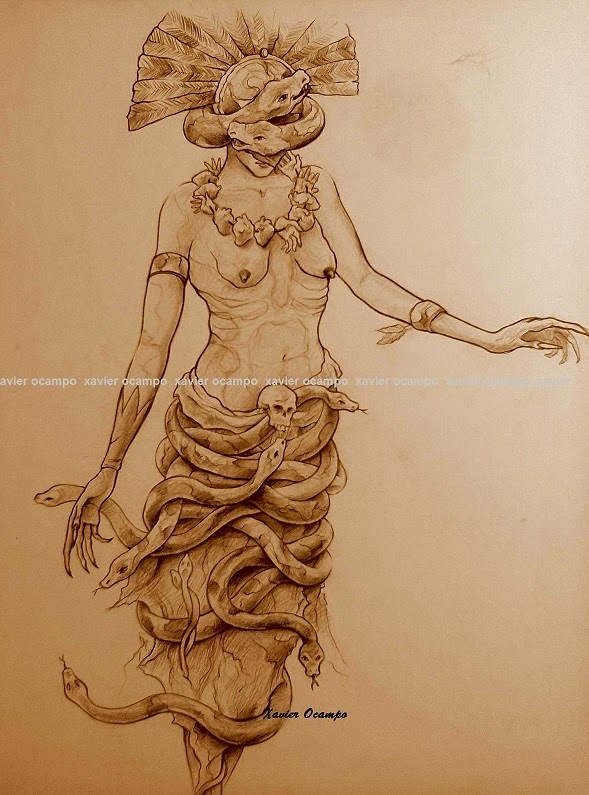 The final, horrific image of Coatlicue is by artist Xavier Ocampo, and was borrowed from his Legends Ilustradas series.